A former Benedictine Monastery formed in the 7th century, it is reminiscent of a cathedral. The ‘Abbey Church of St. Peter’ is noted for music and includes two organs and a peal of ten bells. It is in pristine condition both inside and out. 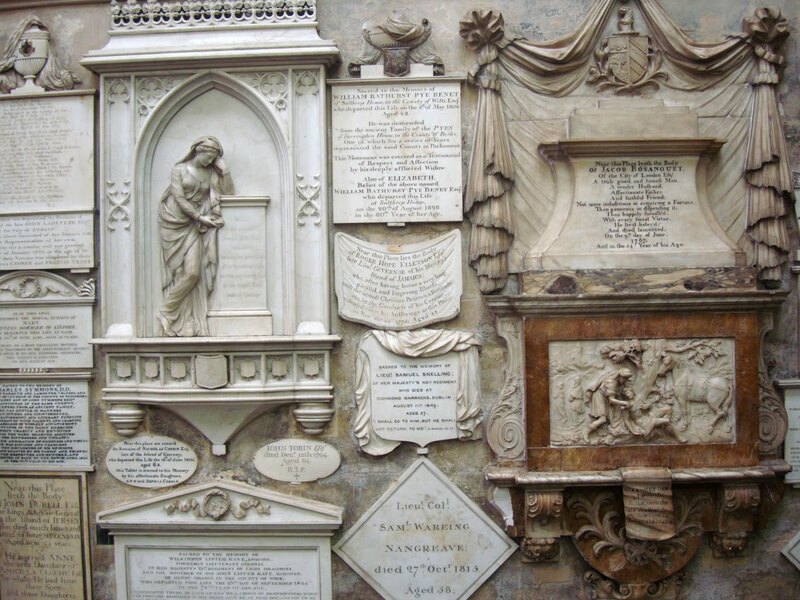 The gothic interior hosts monuments to several notable people. 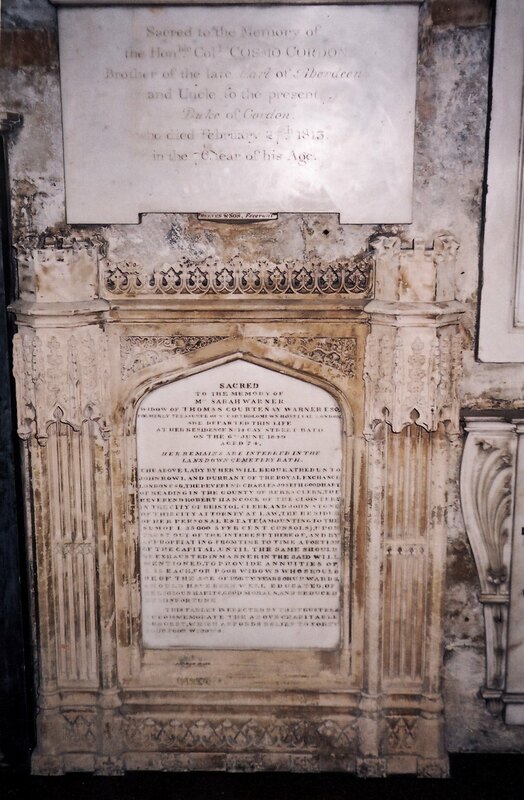 Tombs, crypts and vaults of the socially prominent of the time line the walls and floors (not a resounding endorsement of Bath’s mineral waters) this practice is now forbidden by hygiene laws. 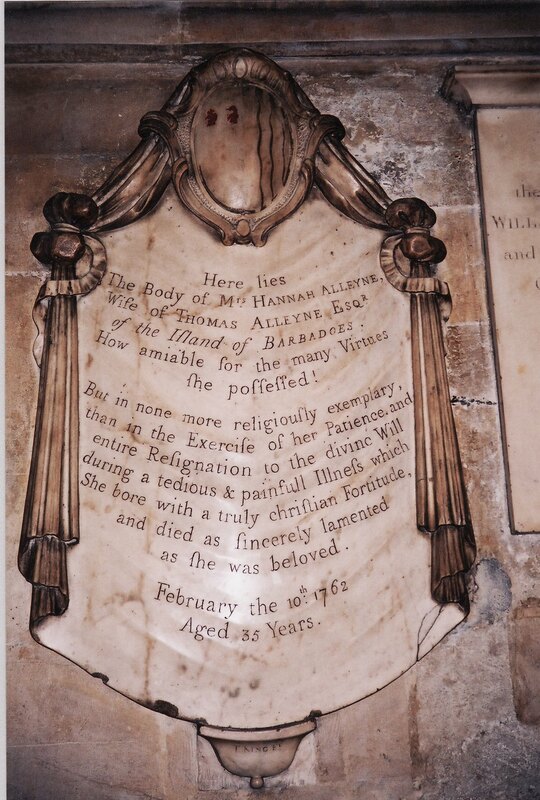 Here lies The body of Mrs. Hannah Alleyne, Wife of Thomas Alleyne, Esqr. of the Island of Barbadoes. How amiable for the many Virtues she possessed! 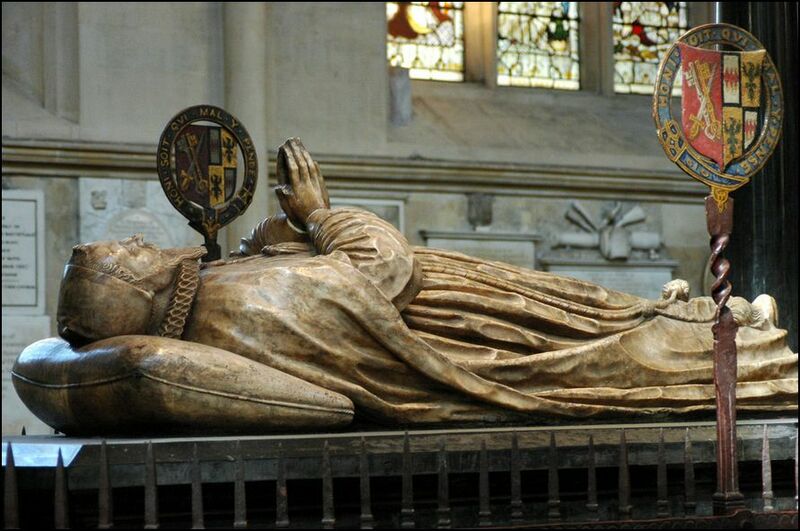 But in none more religiously exemplary, than in the Exercise of her Patience, and entire Resignation to the divine Will during a tedious and painful Illness which She bore with a truly christian Fortitude, and died as sincerely lamented as she was beloved. In 1846 this site was known as Echo Bank Cemetery, and later became known as the Newington Necropolis. 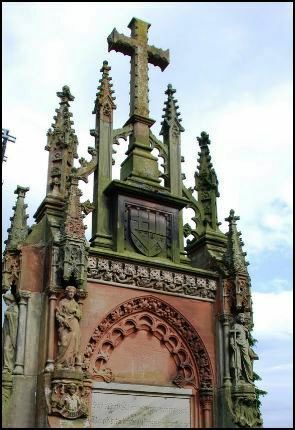 The original Gothic lodge is still in evidence and is used as a gatekeeper’s cottage. 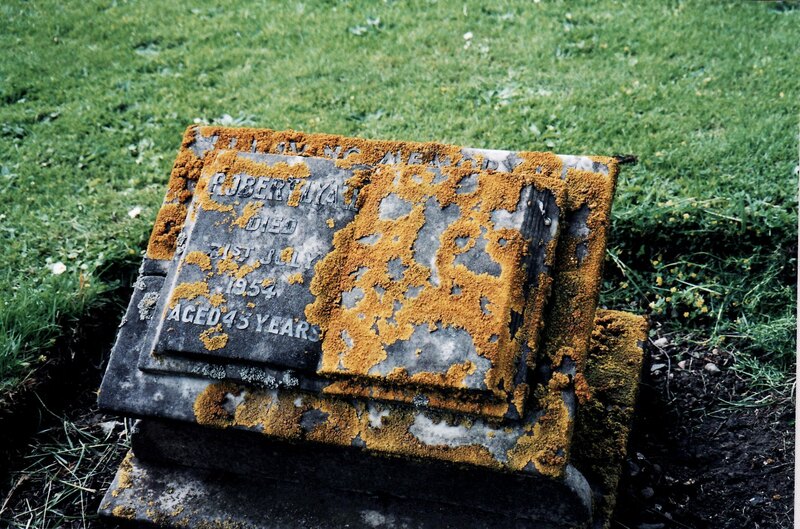 This cemetery is neglected and vandalized. Tombstones are toppled over and broken. 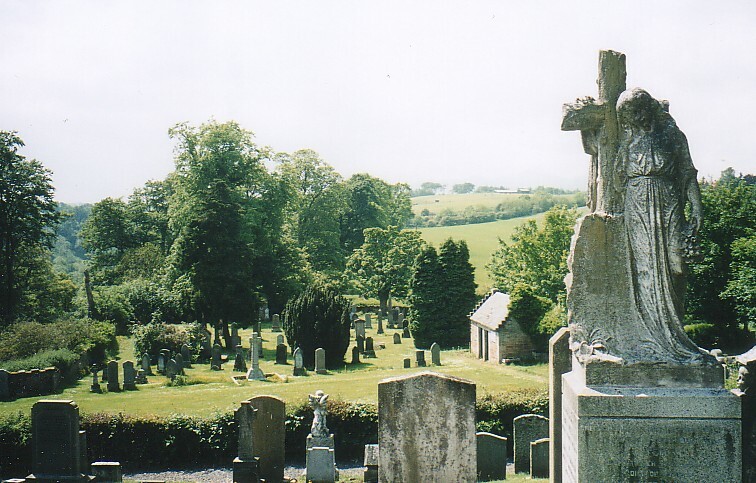 It is overrun with ivy, and in some instances it is impossible to see the headstones. 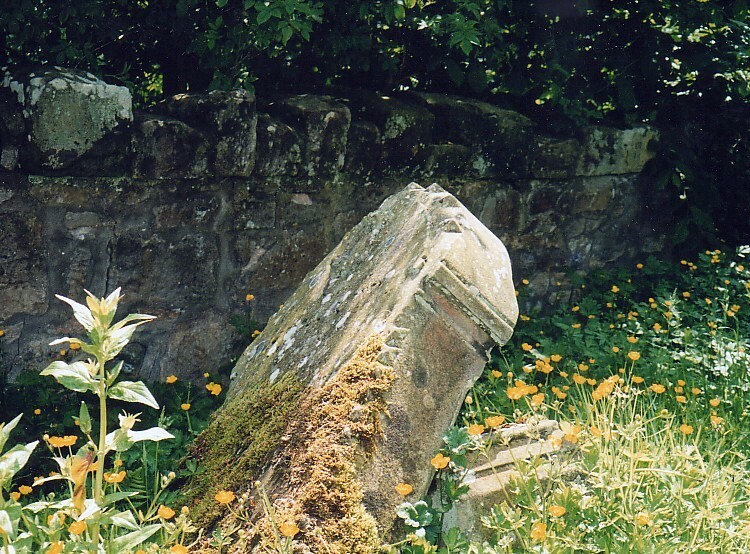 The gravestones located at the perimeter wall are impossible to reach because the ground is covered in vegetation. It is objectionable that this hallowed ground has been neglected and allowed to deteriorate, and yet it is a very peaceful island in the midst of the city where the sun shines through the foliage of the ancient trees and lends a sadness and eeriness to the scene. It is one of the most haunting sites I’ve visited. Large and spacious it covers a large area in the city. It is both open and wooded. The overgrown foliage entangles the tombstones, obliterates the names whilst the shade from the trees plunges the area into gloom. At every turn the rustling leaves seem ominous, and I checked over my shoulder more than once. 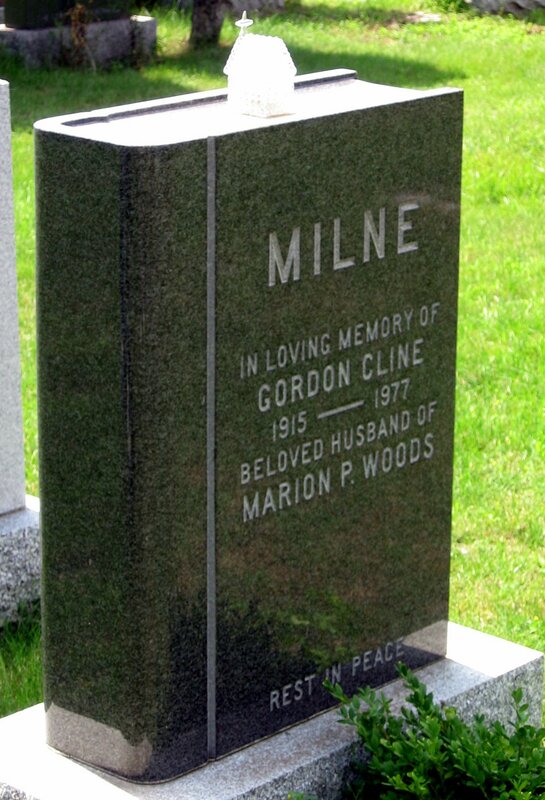 I was transported to a book I once read “A Fine and Lonely Place,” which told the story of an old man who frequented a cemetery. 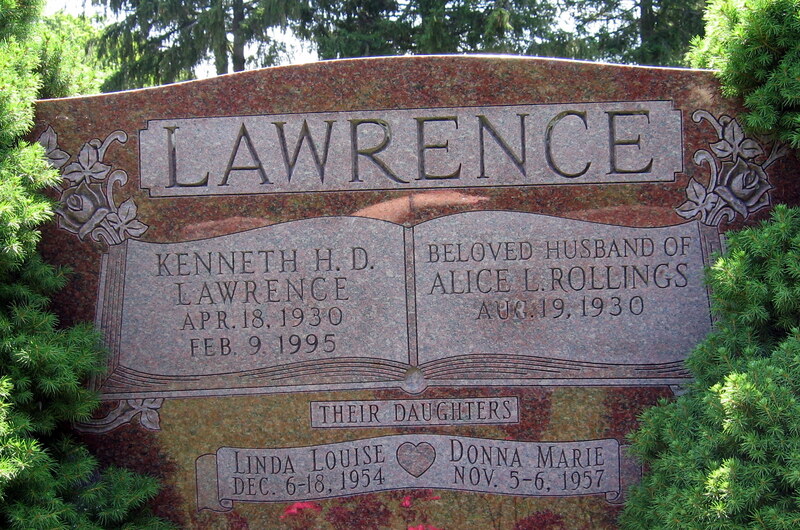 Perhaps that is what triggered my fascination with cemeteries and gravestone and the history of inscriptions. There is a wrought iron fenced area against the front wall containing gravestones with images of the Star of David and Hebrew writing. The Jewish section was created in 1945, and it seems to me vindictive and intolerant that even in death the Jews are segregated from the others. If ever I love thee my Jesus ‘tis now. On Monday I went for a walk in a graveyard. Preoccupied with sombre thoughts in these sombre times, I stood before a huge memorial stone “to the honoured memory of one hundred and thirty nine British sailors and soldiers who gave their lives for their country during the Great War 1914-1918”. 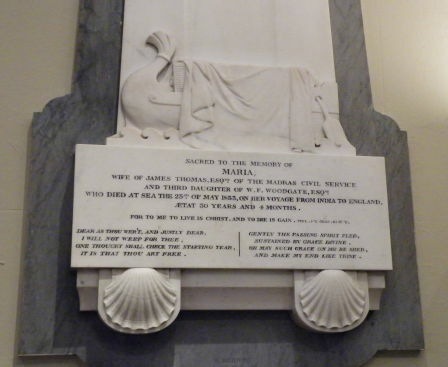 In large letters across the top of the memorial was written: “Their name liveth for evermore”. Behind it was a large ragged heap of stones and an unkempt tangle of undergrowth. The place was dirty, depressing and very cold. These days, there should be no need to remind ourselves of the need to respect the dead. It behoves us all to honour those who have passed away, whether they died by accident, of old age, in the First World War, or in a futile fight for oil. It follows that any civilised society should take great care of its graves. In Newington cemetery near Cameron Toll, where I was, the graves have been allowed to go to rack and ruin. Headstones had collapsed, crosses were broken and graffiti disfigured tombs. Broken glass, rusty tin cans and plastic bags were littered all over the place. In some places the undergrowth was so thick that it was difficult to see or get to the burial grounds. In the summer the graveyard is swamped with weeds and bushes. It is infested with hundreds of giant hogweeds which in sunlight cause serious burns to the skin. It is, as the Conservative prospective parliamentary candidate for Edinburgh South, Struan Stevenson, told me, “an utter disgrace”. He said he had received complaints from local people that “they need a machete to hack their way to their loved ones’ graves”. He thought it was outrageous that a cemetery regularly visited by hundreds of people should have been allowed to deteriorate from a place of rest into a jungle. After two years of hard work by volunteers the cemetery has been restored to its former glory. Dozens of volunteers met each month armed with secateurs, sheers and rakes to tame the undergrowth and uncover concealed graves. During the process an empty catacomb in the centre of the graveyard was discovered. The Friends of Newington Cemetery have produced a map of the 14-acre graveyard identifying the graves of famous people and a Commonwealth War Graves memorial. 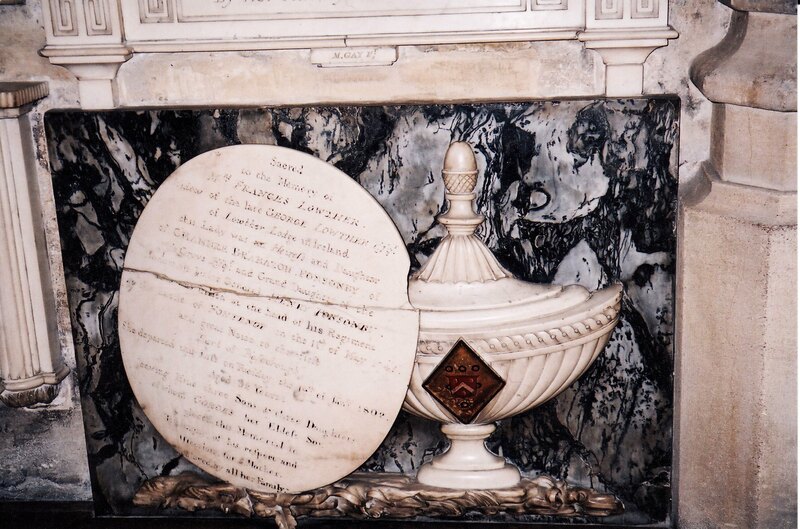 A variety of book symbols are visible on graves in the form of marble objects, engraved images or actual headstones in the shape of a book. A book may be symbolic of the Bible especially if a citation from scripture is present; the most common is resurrection John 3:15: That whoever believes in him may have eternal life. The intention is to advise mourners that worldly concerns are over. 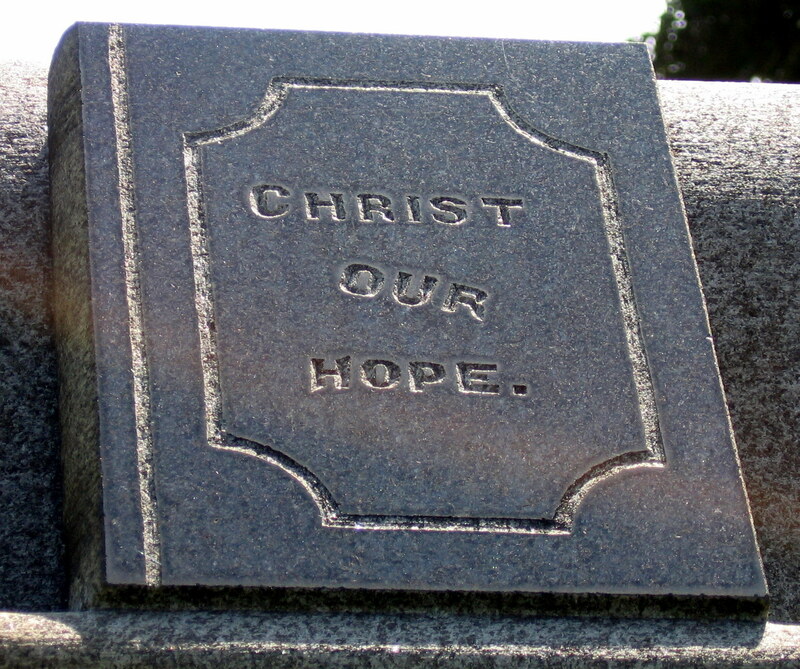 The Bible symbol is often used on the gravestones of clerygymen or devoted religious people. An open book can be used to document history, representing vital statistics and good deeds or accomplishments. 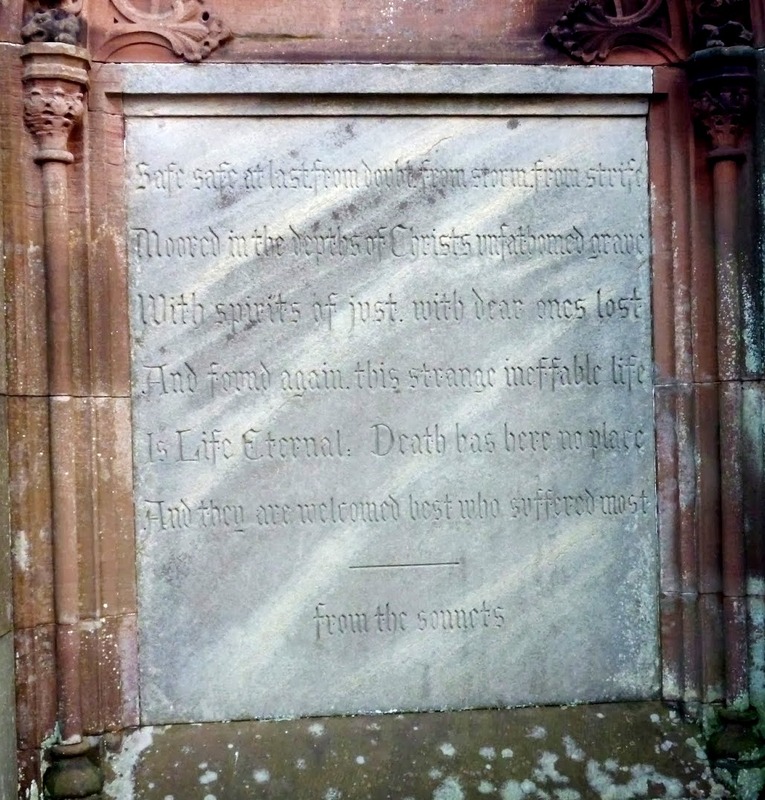 In loving memory of William Small a merchant in Edinburgh died in 1891. A wise counsellor and friend to the poor and fatherless who did justly, loved mercy and walked humbly. Precious in the sight of the Lord is the death of his saints. A closed book represents a story (a life) ended. Death is but the portal to Eternal Life. If the book displays a dog eared page, it is symbolic of knowledge and memory. With the sun shining on it, this has to be one of the prettiest cemeteries I have ever visited. 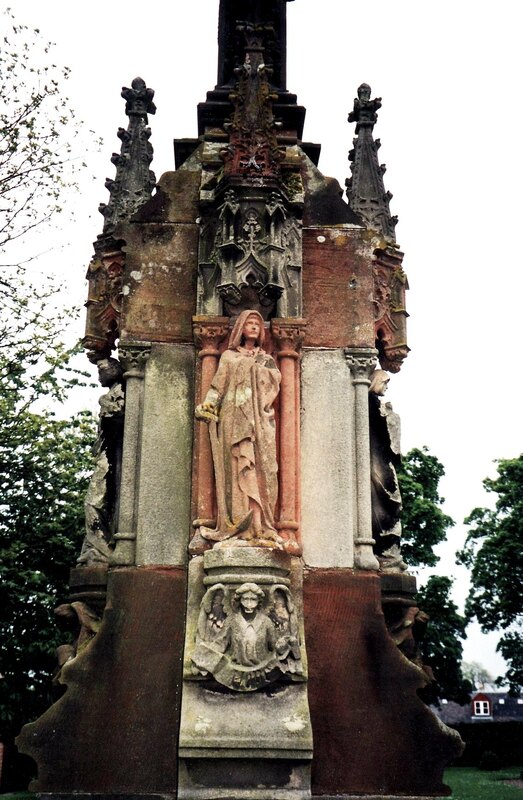 The graveyard is located on a sloping hill to the side of Rosslyn chapel in Midlothian, Scotland. The upper area is terraced beyond which the sloping land gives way to a field. There are numerous statues to lend an air of history to the place. The sound of bees buzzing with little interruption from modern day traffic spirits you away to another time. 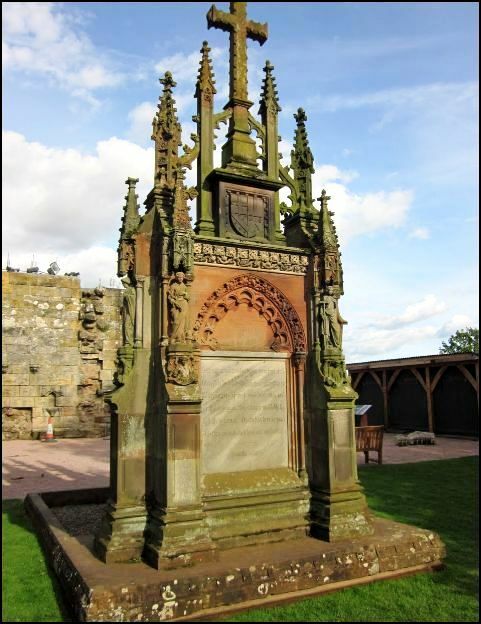 The 15th century Rosslyn Chapel is a beautiful example of architecture and masonry set in a picturesque area overlooking a gorge. The chapel became world famous with the issue of Dan Brown’s novel, the Da Vinci Code. Hundreds of intricate carvings have eroded throughout the centuries, of which are numerous examples of the faces of ‘Green Men’ believed to be a symbol of rebirth or fertility. However, it is most famous for the Apprentice Pillar an intricately carved stone column for which the apprentice was killed by the envious Master Mason. 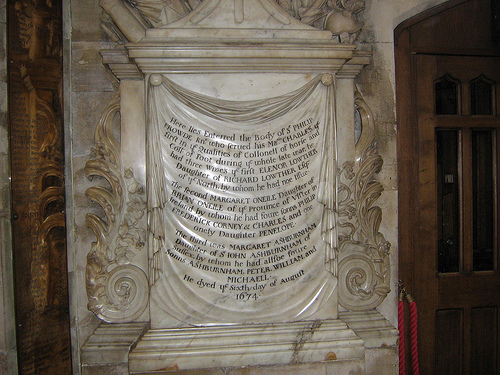 The Chapel is also a burial place for several generations of the Sinclair family. 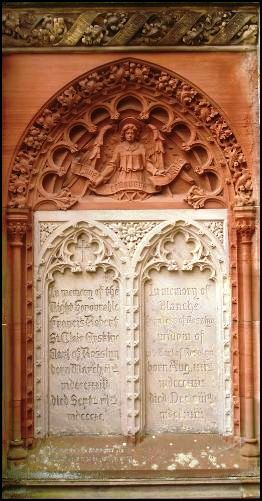 In the south west corner of the chapel grounds is a Victorian memorial to the 4th Earl of Rosslyn. Eternal as the poet’s rhyme. And soars on high to fragrant immortality. On two sides engraved arches contain memorials. The epitaphs for Francis Robert St. Clair and his wife Blanche are detailed on the east side. 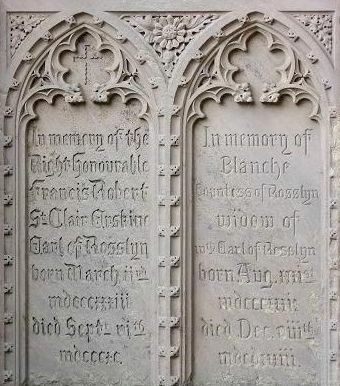 In memory of / Blanche / Countess of Rosslyn / Widow of 4th Earl of Rosslyn / Born Aug 22nd / 1839 / Died Dec 8th / 1933. 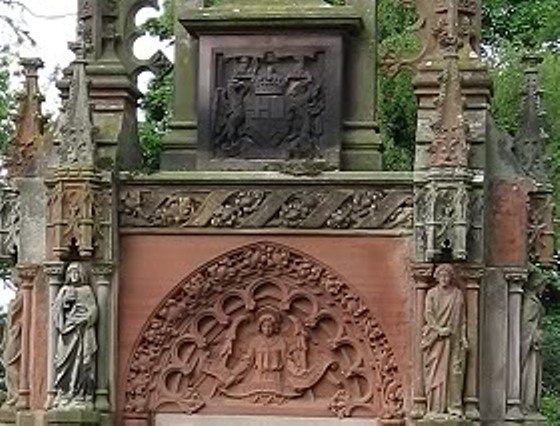 The crest displayed atop the headstones is the Earl of Rosslyn’s heraldic arms. 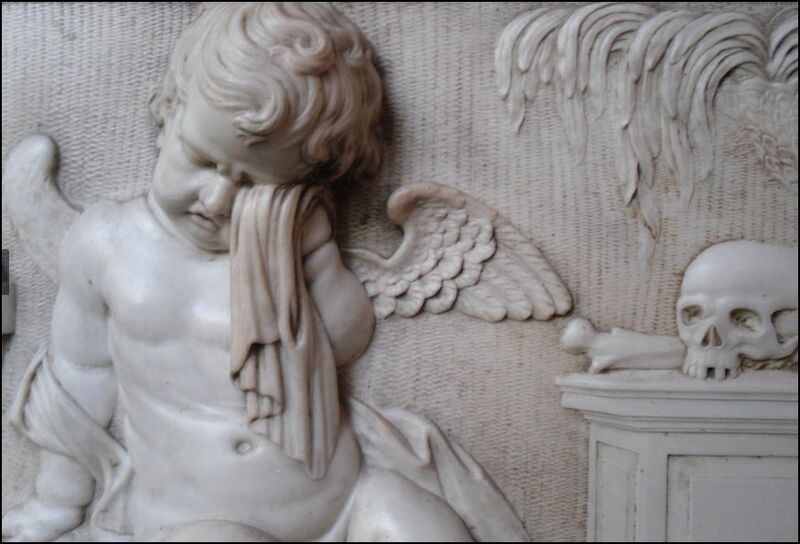 Within the peak of this arch an angel holds a banner with a Latin quote from the Roman poet, Virgil: Omnia vincit Amor, et nos cedamus amori translated as Love conquers all, and let us surrender to love. And they are welcomed best who suffered most. The structure is highly decorated with statues, spires, and angels holding banners with the words, Love, Courage, Hope, Patience, Faith and Truth. The memorial is surmounted with a cross terminal.